Where have all the insects gone? Perhaps they were deterred by Editorial Board composition! In a recent Animal Ecology in Focus blog post, the Executive Editor of Journal of Animal Ecology, Ken Wilson, made a spirited response to my well documented Twitter comments about the lack of insect papers in the journal and also highlighted by me in the recent JAE Virtual issue which I compiled to celebrate National Insect Week 2014. Ken had been somewhat sceptical about my claims but when he analysed the data he found, much to my gratification 😉 that I was correct; the number of insect papers published by Journal of Animal Ecology, has indeed fallen steeply since the 1970s, and this was true for two of the other journals from the British Ecological Society’s (BES) portfolio, Journal of Applied Ecology and Functional Ecology. Figure 1. 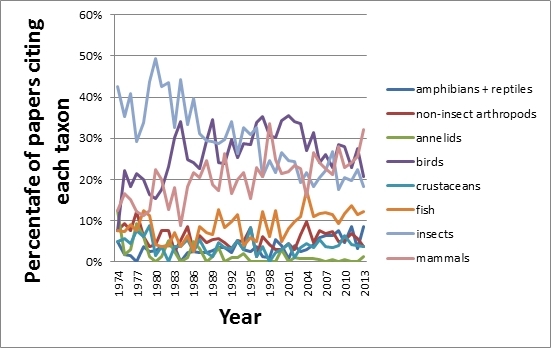 Trends in the number of citations per taxon in Journal of Animal Ecology (reproduced from Ken’s post). Ken also looked at Ecology, published by the Ecological Society of America and Oikos, published by The Nordic Society Oikos. In both cases he found that insects and other invertebrates had held their own over the last forty years. Ken refutes any claim of editorial bias, acceptance rates for insect papers are similar to those for vertebrate papers, and hypothesizes that the reason insect and invertebrate papers have declined in the BES journals is due to the subject areas favoured by the journal i.e. demography, evolutionary ecology, spatial ecology and disease ecology; fields that in the UK are dominated by vertebrate ecologists and/or the rapidly decreasing number of entomologists employed by UK universities. This may be a contributing factor, but entomologists in the UK and worldwide also work in these fields, so it cannot be the whole story. He urges the entomological community to submit more papers to the journal in order to redress the balance. So what has changed since the 1970s? Back when I was a PhD student, ecological entomologists had no hesitation in submitting their papers to Journal of Animal Ecology, Oecologia and Oikos, or if their work was applied, then Journal of Applied Ecology was a first choice venue, with Annals of Applied Biology also considered a logical place to submit entomological papers. Looking back at the papers published from my PhD work, I find that I published one in Journal of Animal Ecology (Wellings et al, 1980), one in Journal of Applied Ecology (Leather et al, 1984 (back in the early 1980s Journal of Applied Ecology could take over a year to make a decision), and three in Oecologia (Leather et al, 1983a,b; Ward et al., 1984). Of my other more applied work, three were published in the Annals of Applied Biology and the rest in specialised entomological journals, (five in Entomologia experimentalis et applicata, and three in the Journal of Applied Entomology). So why did entomologists have no hesitation in sending their papers to Journal of Animal Ecology and Journal of Applied Ecology in the 1970s. A quick look at the Editorial Boards of the two journals, admittedly much smaller than those of today, shows us that in 1977 (when I started my PhD), Roy Taylor (entomologist) and Malcolm Elliott (fresh water ecologist) were editors of the former, with and editorial board consisting of T B Bagenal (fish), R A Kempton (statistics), Mike Hassell (entomologist), John Krebs (birds), John Lawton (entomologist), A D McIntyre (marine invertebrates) and John Whittaker (entomologist); Journal of Applied Ecology jointly edited by entomologist, Tom Coaker and botanist R W Snaydon, had a slightly larger board, eleven in total, five botanists, two more entomologists, an invertebrate ecologist, an environmental physicist and two vertebrate ecologists. So for both these journals, vertebrate ecologists were in the minority. Moving on to 2014, what is the current composition of the two boards? Journal of Animal Ecology, is dominated by vertebrate ecologists, 62%, with only 25% being invertebrate specialists. Journal of Applied Ecology is also dominated by vertebrate ecologists, 48%, with 28% being plant scientists of various hues and only 21% being invertebrate ecologists. 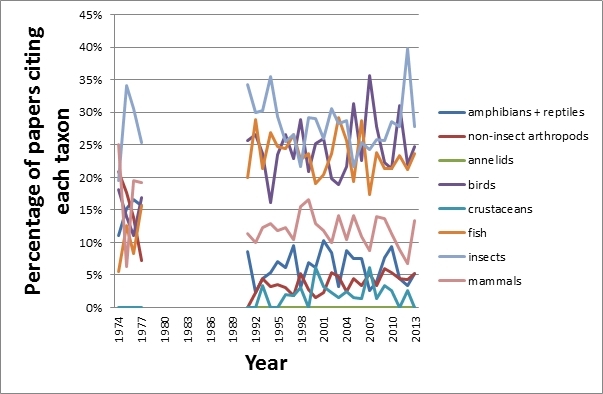 Now let’s have a look at the two journals where there has been no change in the proportion of invertebrate papers published; Ecology is remarkably balanced, although invertebrates are under-represented; 27% plants, 27% vertebrates, 26% invertebrates, 9% microbial. Oikos has an even better board composition, 41% being invertebrate ecologists, 29% plant ecologist and a mere, although still over-represented, 17% being vertebrate ecologists. In summary, although I am sure that there is no explicit bias against invertebrates by the Editors of either Journal of Animal Ecology or Journal of Applied Ecology, the very fact that their Editorial Boards are dominated by vertebrate ecologists acts as an attractant to vertebrate ecologists and as a deterrent to entomologists who thus choose to submit their papers elsewhere, resulting in the vertebrate dominated situation we see today. Why would this be so ridiculous I ask? This is another good example of institutional vertebratism. After all, as Ken points out to us entomologists (and of course this includes Ken himself) “for taxon-specific papers, there are plenty of excellent specialist journals” This applies equally to the vertebrate world, so why shouldn’t a journal of animal ecology be dominated by invertebrates? Leather, S.R., Ward, S.A. Wellings, P.W. & Dixon, A.F.G. (1983) Habitat quality and the reproductive strategies of the migratory morphs of the bird cherry-oat aphid Rhopalosiphum padi. Oecologia, 59, 302-306. Leather, S.R., Ward, S.A., & Dixon, A.F.G. (1983) The effect of nutrient stress on life history parameters of the black bean aphid, Aphis fabae Scop. Oecologia, 57, 156-157. Leather, S.R., Carter, N., Walters , K.F.A., Chroston, J.R., Thornback, N., Gardner, S.M., & Watson, S.J. (1984) Epidemiology of cereal aphids on winter wheat in Norfolk, 1979-1981. Journal of Applied Ecology, 21, 103-114. 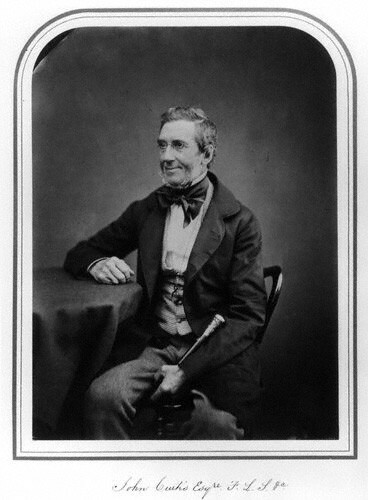 Wellings, P.W., Leather, S.R. & Dixon, A.F.G. (1980) Seasonal variation in reproductive potential: a programmed feature of aphid life cycles. Journal of Animal Ecology 49, 975-985.